Bleary Young Farmers’ Club attended the dairy stock judging and silage assessment heats with members making it to the Northern Ireland finals. On April 1, 2019, Bleary YFC members attended the heats of dairy stock judging and silage assessment at Markethill Mart. Almost 30 members from Bleary YFC attended the event with a fantastic effort by all members. Well done to all members who participated and especially those who got placed and will attend the Northern Ireland finals. First place Lucy Morton (14-16), third place Ryan Holmes (14-16), second place Kathryn Morton (16-18), third place Richard Martin (16-18), first place Colin Capper (18-21), third place Abby Morton (18-21), first place Emma Malcomson (21-25) and second place Zoe Maguire (21-25). Silage assessment results have not yet released. 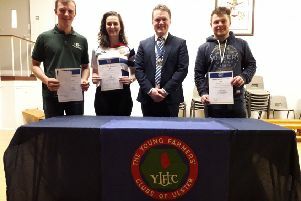 This is an excellent achievement for Bleary YFC and a fantastic start to the competitions for 2019/2020.